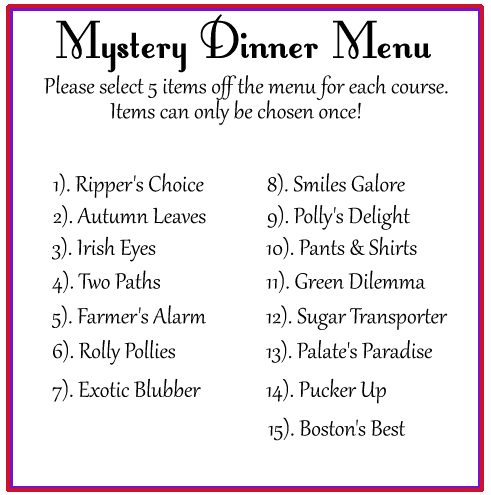 You will be serving a mystery meal dinner where the guests order from a menu, without knowing what those menu items are! There should be much fun when the guests get their courses and find out what they actually ordered! 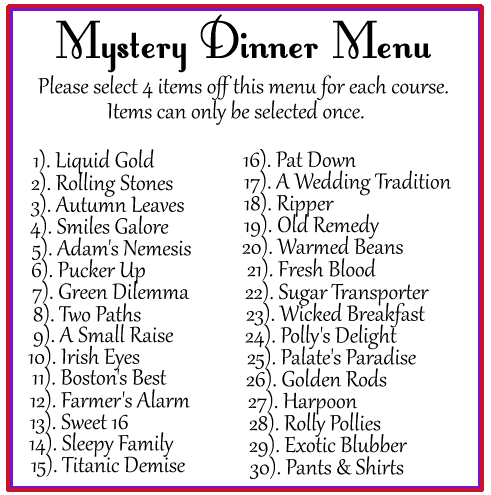 You provide a menu with the foods and drinks all given different names (Code names) These names are usually in some way related to what the food is, and the guests might have fun trying to guess them. You could also name them to do with a particular theme, such as Halloween. 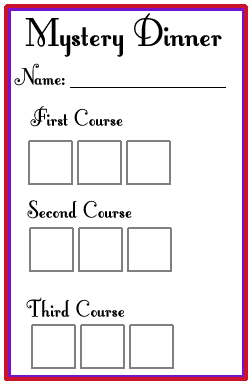 If you wish, you can include the eating utensils in the list of items to be ordered, so that guests have to try and choose those without knowing what food items they will be served. Making for some hilarious mealtimes when someone orders soup with no spoon, spaghetti with chopsticks, or even a meal of only cutlery and no food! 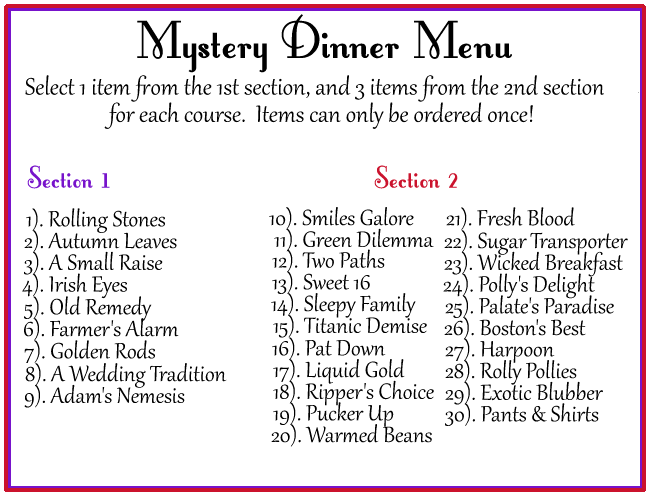 Guests need to order their entire meal for the evening at the beginning, before any of the foods have been revealed, so they have no idea what will be served. What you serve and how you organise it is completely up to you. Since there are different ways people like to do this type of meal, there are some suggestions here for what you could do. Usually all dishes are to be finished before the next course is served, removing all plates and utensils before the next lot is served. Perhaps after the final course, all guests can be offered seconds of anything they like, to help use up leftover food and ensure everyone has had their fill. This option means some people may end up with a course of only utensils, followed by a course of soup and icecream with no utensils! So it can be a funny and unpredictable meal, but may not be filling enough for the guests, and some guests may go without a drink or utensils. 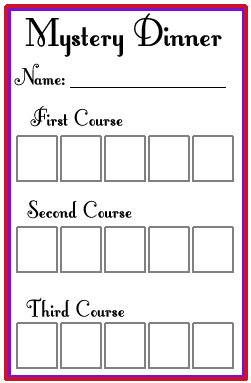 Limiting it to 1 choice per column in each course means they should always have a course consisting of 1 utensil, 1 drink and 1 decent portion of food. So the results won’t be as funny, but everyone should have enough to eat and drink. This ensures everyone gets proper food each course, but other random food/drink/utensils as well. This gives everyone the same food, drinks and utensils, but served differently. If you have guests with food intolerances, you may like to mark the menu to make sure they don’t choose something they will not be able to eat, or serve only intolerant-safe foods. If you want to allow guests to select their utensils each course, you can use different names for them in each course to give them more options.